How to build a loyal brand audience — Spruce Rd. Just a few months ago Blue Bell announced its first ever recall of ice cream. They found Listeria in one of the products, leading to a handful of people hospitalized, and ultimately to the death of three people. If you are familiar with my blog, then you know that I am by no means a journalist or reporter! So why would a post about the recent Blue Bell news make its way to my platform? Instead of talking about the news, it is worth breaking down how this company recovered from such a tragic crisis, and ended up with more brand loyalty than ever before. As a native Texan, Blue Bell has worked its way into several conversations recently, since it has Texas-sized pride due to its local headquarters. It is an iconic Texas brand, known for its homegrown image, and of course its delicious treats. 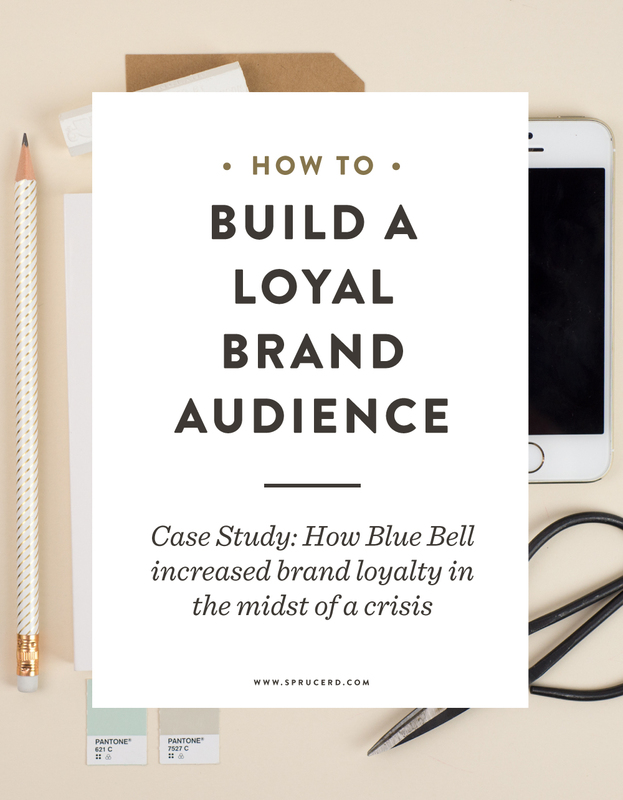 Let’s dive into how Blue Bell has gained such loyal brand ambassadors, as well as a few notes on how you can do the same in your business. Before we jump into how to recover from a rough patch, you first have to uphold a strong + lasting brand. Blue Bell has been around for over a century, and slowly grew its business to the size it is today. They have stayed in the ice cream business, and only expanded within that market of other frozen treats. They are loyal to their brand, and don’t expand beyond what fits. Their image is trusted by their fans, especially Texans. Blue Bell is one of the top three ice cream producers in the nation, up there with Ben & Jerry’s and Haagen Daz — despite the fact that it is only sold regionally. There is some serious brand loyalty happening here, and that only develops from the roots of a quality + lasting product. Take Action: How can you create a product that will last through the inevitable trials + changing market? Avoid thinking of immediate income opportunities, but instead think of long-term brand loyalty in a quality product. This probably goes without saying, but integrity in your work and strong ethics are a must for any brand. Yes, sometimes having integrity will literally cost you money (it has for me), but ultimately it is the right response for your brand + customers. I won’t labor on this too much, because I know you are on the same page with me here! Blue Bell opted to shut down all operations for 4 months. The bacteria was only in one limited sold product, however they decided to shut down everything… in the summer months no less. This screams to their customers that they take this seriously, and are willing to take a major hit financially in order to do what is right. Blue Bell put people over profits. Ultimately, your audience will respect your brand, and increase their pride. Because of their loyalty to the Blue Bell product, fans have a higher degree of forgiveness, where weaker brands most likely wouldn’t survive this PR nightmare. Some of the right decisions you make go unnoticed, so I want to encourage you to still have integrity in your business despite who is or isn’t watching. People will eventually learn to trust your brand, if you make the right choices/responses over time. Take Action: Sometimes having integrity will cost you. Make an effort to set boundaries in your business now, so that you don’t cross those lines later. Designers: purchase the correct font licenses, and don’t download bootlegged versions or copy fonts from your friends. This is all too common, and we need to put an end to it. End: soapbox :). It’s no secret, when you are thinking about investing in a service or product, you inevitably will search for reviews or testimonials. Whether that is on Amazon, or for a course you are about to purchase, you crave that validation that the money your are about to spend is worth it. We feel a sense of trust and ease when we hear in someone else’s words that the product, service or investment is a good purchase. 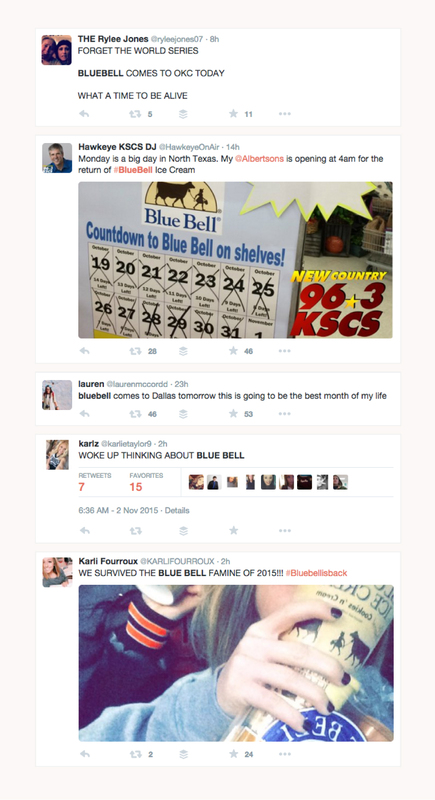 Blue Bell knew this strategy, and stepped back to allow the customers to do the talking. What resulted was nothing short of brand magic. Their customers are SO loyal, they were very vocal about their anticipation for the Blue Bell return. Blue Bell’s marketing team could not have had the same effect if they tried to on their own. The words of the customers were so powerful, genuine, and just plain silly that it created a sense of hype around their product return. What if you don’t have customers for your product? I’ve been there! You are just starting out, and you don’t have reviews on your services, products or courses. How can you possibly showcase an outsider’s perspective, when you don’t have the customer base like Blue Bell does? If you don’t have many vocal brand ambassadors, think of what voices you can showcase that support your brand. I’ve made this mistake before, where I neglected a testimonial, and I’m learning to get past that barrier, and ask for support. When I first started my Lunch + Learn series, I didn’t have many viewers. I knew that I wanted to showcase support for the free workshop series, so I reached out to a couple designer friends and those who reached out to me about design advice. I asked permission to use their candid responses on my sign-up page, and they were more than willing to help. As a bonus, I included an email response from my dad about my first workshop (thanks for the support dad!). I think the light-hearted testimonial from my dad added an element of personality and whimsy to the testimonial section. Take Action: Think of ways you can incorporate that social proof to your brand. Take screenshots of positive + supportive tweets to you, save emails that show encouragement, and don’t hesitate to reach out to friends in your industry. Blue Bell’s survival of this rough patch is proof that branding plays a significant role in a sustainable business. Without attention to their brand (their core message, customers first, overall vision), Blue Bell would not have had such a graceful return to the market. Their absence during the peak summer season only heightened their brand, and produced even more loyal brand ambassadors. Take notes from how they achieved this reaction, and as you build your business do so in a way that puts people first, above immediate profit. Older PostSpruce Rd. is expanding!